In 1977, Iowa recorded its first bald eagle nest in 72 years and amazingly, little more than 3 decades later, 294 young were reared across 92 counties during 2012. Declared our national bird in 1782, the bald eagle was on the brink of extinction during the 20th century until measures were taken to save it. 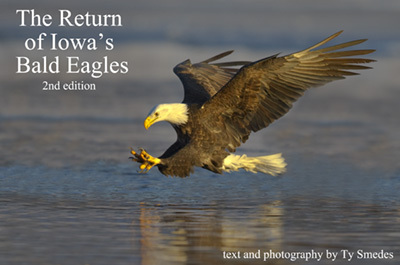 This 2nd edition of The Return of Iowa’s Bald Eagles chronicles this conservation success story with new facts and anecdotes. New nesting charts and statistics are included, and wintering charts and statistics are current through 2013. Additionally, the photo gallery has been enriched with over 70 new action photos, and six new and amazing photo-sequences that showcase Iowa’s Bald Eagles twisting, turning, diving, and catching fish. These spectacular color photographs – among the most incredible photographs ever taken in Iowa and the US - have captured the power, grace, and majesty of the Bald Eagle as it returned to prominence here in Iowa. Wholesale price for bookstores is available. Please contact me for details.